We produce grinding wheels for springs to be used on double disc grinding machines. Given that the wheel does not change its dimensions during use, the position adjustment of the grinding wheels for springs is no necessary. For many applications, our grinding wheels for springs effectively replaces the ‘old‘ abrasive wheel, thanks to a fast and precise cut. 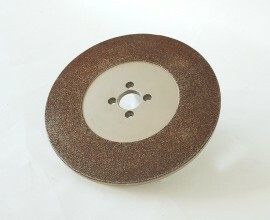 Are you interested in our grinding wheels for springs? Contact us now!